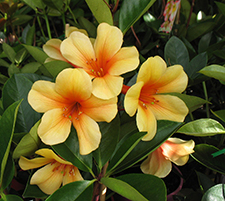 A tropical flowering shrub producing clusters of lovely, waxy, trumpet-shaped blooms. Perfect for pots. In the garden they prefer morning sun or a well lit shaded spot. 200mm $47.50 Special price: $0.00. No online sale. 140mm $24.50 Special price: $0.00. No online sale.